First of October. 2007, and a Monday and a start of a workweek. Here's what's in my Mr. Bento. There's a breadbowl with a roll from Ft. Lauderdale, FL, and rye from Rockville, MD. Next to is is the fishbowl, with smoked salmon and whitefish salad, divided by sugar snap peas. Below it is the onion cheese and tomatoes bowl. Bamba snack from Israel; Swedish sweet oat crips from Ikea. Surprised? Much! According to BuzzFeed, as of this morning, this blog was among the best links on the Internet on Mr. Bento topics. Usually, I pack Mr. Bento up the night before, but I had a late night out yesterday. So, today, I got out of bed 10 minutes early and threw this together. Here is what I packed from Friday, September 28, 2007. The onion cheese in with the tomatoes is from an Amish market in Germantown, MD. The black rice ume onigiri was thawed out from a stash I'd made earlier. With the carrots, it almost looks like Halloween. The yogurt has a sliced plum. The olives are stuffed with sun-dried tomatoes, and have mini sweet pickles with them. 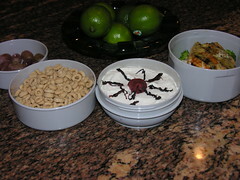 Thursday, September 27, 2007, finds these items in my Mr. Bento for breakfast and lunch. Cheerios for breakfast. For lunch, a TJ's black bean vegetarian burrito, butternut squash with cranberries, and tayglach. For midweek, I filled my Mr. Bento with a Cedar platter from Cedar Cafe: hummos, baba ghanouge, tabbouleh, eggplant salad, kibbeh, sambousick, stuffed grape leaves, and pita. Sambousick is pastry dough, filled with ground beef, lamb, pine nuts, and spices, deep-fried. 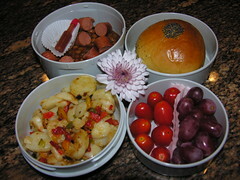 Tuesday, September 25, 2007, will have these items in my Mr. Bento. Cheerios for breakfast. Chicken pot pie for lunch, with fruit cocktail, and taylach. The tayglach is a Russian Jewish confection common around Rosh Hashonah, to encourage a sweet new year. 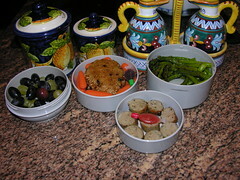 First workday of fall, and here is what I'll be packing in my Mr. Bento for Monday, September 24, 2007. The brisket is a left-before, since I froze two lasagna pans of it this afternoon, cooking ahead. Rye bread on the side and grapes for dessert. The Cheerios are for breakfast. 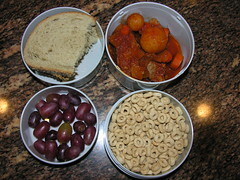 For Tuesday, September 18, 2007, here's what's in my Mr. Bento. For breakfast is a red bean chunk bun from Crescent Bakery. For lunch there are a Tabasco bottle afloat on a sea of franks 'n' beans, homefries, tomatoes, and grapes. Monday, September 17, 2007, already? 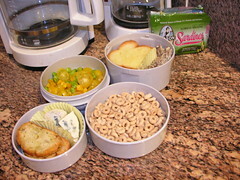 Here's what's in my Mr. Bento for breakfast and lunch for that day. The curry bun for breakfast is from Crescent Bakery. 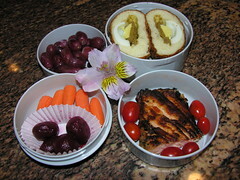 For lunch is grilled salmon with tomatoes, carrots and pickled beets, and grapes. 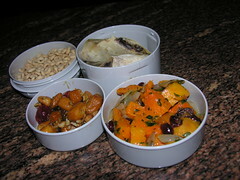 I copied Biggie's foil idea for my Mr. Bento entree for Tuesday. It'll keep my hand grease-free when eating the chicken leg. In the entree bowl is corn, tinged pink from being too near some beets, along with tomatoes and a habanero saucefish. The side dish is butternut squash soup with cinnamon. Dessert are grapes and cheddar cheese. Another week begins. 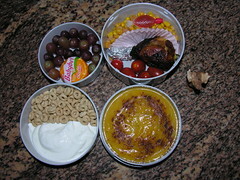 My Mr. Bento for Monday, September 10, 2007, will contain Cheerios for breakfast, yogurt topped with umeboshi and shiso leaves, grilled haddock with lemon sayuce over steamed vegetables, and grapes. The limes are just there, waiting for another day. Here is a hilarious new comic strip. 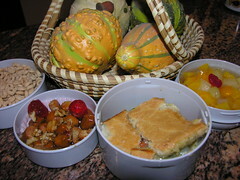 The workweek ends with these items in my Mr. Bento for Friday, September 7, 2007. The genmai yaki onigiri is edged in sesame seeds. Lunch is mixed grapes, toasted brown riceball, carrots, and soysauce fish, chicken bratwurst and habanero sauce fish, and roasted asparagus. Main course in my Mr. Bento for Thursday, September 6, 2007, is leftover chicken and ratatouille sauce with linguine. 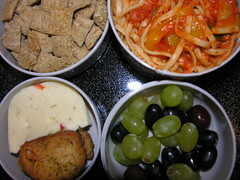 Side dishes are vegetable farmers cheese and garlic herb toast, plus mixed grapes. Breakfast are TJ's shredded wheat. The cheese is from the Germantown, MD, Amish market; the toast and grapes are frrom Whole Foods. 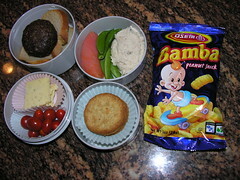 What a mixed up bunch of stuff in my Mr. Bento for Wednesday, Septem,ber 5, 2007. Breakfast is Cheerios. Behind it for lunch is a sardine salad with mayo and wasabi mayo, to spread on challah. On the left is a mixed-up sort of succotash I nuked in the micro, with TJ's roasted corn, edaname, chopped orange bell pepper, and sliced yellow tomatoes. Up front is some herbed garlic toast from Whole Foods and some danish blue cheese. Goodbye, Labor Day. 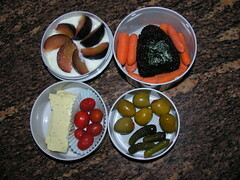 The workweek starts on Tuesday, September 4, 2007, with these contents for my Mr. Bento. Our youngest son is still home from college (quarter system = late start). 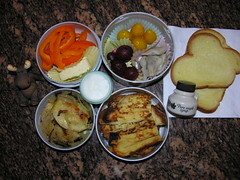 He went camping with a couple of college friends, so we made them french toast; leftovers for breakfast on the Mr. Bento. The pierogies, beets, and havarti are from an Amish market in Germantown, Maryland. I made the pierogies as heart-healthy as I could, frying them in SmartBalance and topping them with fat-free yogurt. Here is the line-up: challah, orange bell pepper, havarti cheese, yellow tomatoes, pickled beets, pickled herring, sauerkraut and potato pierogies wth fried onions, french toast, and maple syrup.